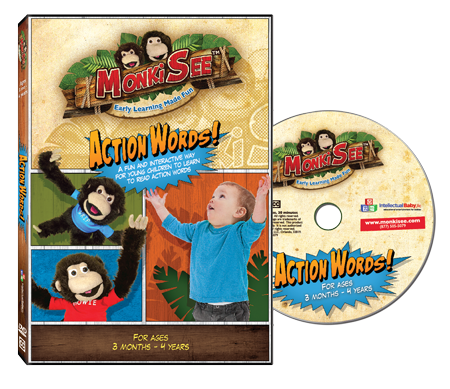 The MonkiSee Action Words DVD is a high energy, interactive 30 minute video that exposes young children to 30 action words. Children learn to read as they move along with Howie and Skip to the original MonkiSee “We Run” song. Action Words encourages children to move their bodies while learning to read. The Action Words DVD introduces words followed by real life footage of people and animals demonstrating the actions. This interactive DVD includes plenty of review and repetition making learning to read easy, and enjoyable. Throughout the video the words are reviewed through song and children are encouraged to move along. The MonkiSee Action Words video includes lots of relevant narration, and includes poetry to stimulate early language development in babies and young children. Teaching babies should be fun. The MonkiSee DVDs combine equal amounts of education and entertainment to guarantee that babies and young children enjoy the learning process. The MonkiSee products are designed to be a tool for parents and caregivers to use to teach children to read. Parents should interact with their child throughout the DVD. Encourage play, discussion, and dialogue while watching the DVDs to stimulate your child and help them gain a better understanding of the concepts being taught. Sharing learning with your child creates a long lasting bond between parent and child. The MonkiSee Baby DVD Collection is a unique video series, designed to teach babies as young as 3 months old how to read. Your child will be introduced to Howie and Skip, brother Howler monkeys from the jungles of Belize. Throughout this playful series, Howie is teaching his baby brother, Skip, how to read. Your baby will be reading along with Skip before too long. Created by a mother of 6 playful children, this series is full of fun! Starring Howie and Skip, MonkiSee Action Words is guaranteed to delight babies everywhere.